← Home Buyer Tax Credit – How do you get it? There is already a lot of attention on this one! I’ll just give it a little more. 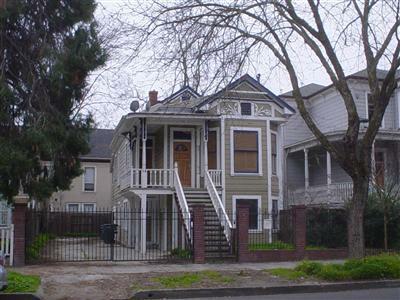 The house at 1426 F St. is now bank owned and on the market. This would be one creepy listing to take on. When I first moved to Midtown, Sacramento (Boulevard Park) in the early 2000’s I heard the stories of Dorthea Puente – especially because I had some friends that lived on the same block. As the story goes, in the late 1980’s, Dorthea, an older woman in her late 50’s, ran a boarding house with other elderly folks living there as borders. The live-ins did not have family or others that cared for them … the perfect situation for Dorthea to poison them and continue to collect their social security checks. Over time she got caught and the police dug up seven bodies in the backyard! Supposedly the neighbors had complained about a continued stench coming from her property over the years. And finally the social workers got suspicious when their clients began to disappear. Dorthea is in currently in prison – serving a life sentence for murder. For a fuller story, check out this recent article or this one for more details – or just search Dorthea Puente. As disclosure laws go, one has to be up front with the history of a property, especially when it is as notorious as this one. And it would be hard to hide this one in the backyard. It’s interesting to note that the yard has been paved over – sort of like, let’s seal in whatever might lie beneath the surface. Would you buy a home where a serial killer resided? Is it going to sit on the market? Or sell quickly? This entry was posted in Local, Midtown and tagged Buyer, buyers, Local, Midtown, news, Real Estate, Realtor, Sacramento. Bookmark the permalink. What a crazy story! Especially about the yard being paved. Sold “as is” takes on a new meaning with this house. Would you dare dig up the front yard? Nice house, not so story behind the house. It last sold for $560,000 in 2005.